Well, maybe “worried” is a bit of a stretch. My personal welfare, and that of most of my friends and loved ones, thankfully does not hinge on the success of the 2018 Kia Stinger GT. But here’s the kind of car that enthusiasts have been after, the kind of car internet commenters say they’ll buy, and I’m not convinced anyone’s going to buy it. If you’re just joining us, at the Detroit Auto Show this week Kia pulled the wraps off a legit, honest-to-God rear-(or all-) wheel drive sport sedan, one that in GT form has a twin-turbo V6 putting out a very robust 365 horsepower. They even tuned the thing on the Nürburgring, which I do not think you can say about the Soul. It looks good, too—low and wide and long with tasteful scoops on the hood. It’s not as ostentatious as some high-performance sedans, but it’s quite attractive and even compelling in person. It puts that A7-ish shape to good use too, being a legitimate liftback and not just a sedan that looks like one. If I have one criticism it’s that to the casual observer, it may not look too far off from the Kia Optima, a handsome and highly competent but otherwise boring and pedestrian front-drive sedan. Who’s going to pay that much for a Kia? No matter how good it gets, it’s not a luxury brand, and it’s one with no performance credibility or heritage at all. Granted, you have to start somewhere, and the Stinger is exactly that. But it’s a very hard game to break into. There’s also the matter of the dying sedan market. It’s no coincidence that almost all the cars you’ve seen out of the Detroit show today have been SUVs or boring crossovers. Those are the profit-makers now. Buyers are flocking away from sedans in droves. I hate to say it but Kia probably should have done this four or five years ago. Oh yeah, did you hear the Chevrolet SS is dead too? It is. The original Stinger concept was a small-ish rear-wheel drive coupe with a turbo four-cylinder engine, a kind of base Camaro/BRZ-fighter. That didn’t happen, and it’s probably for the best for Kia that it didn’t because the sports car segment is even more screwed than sedans are. 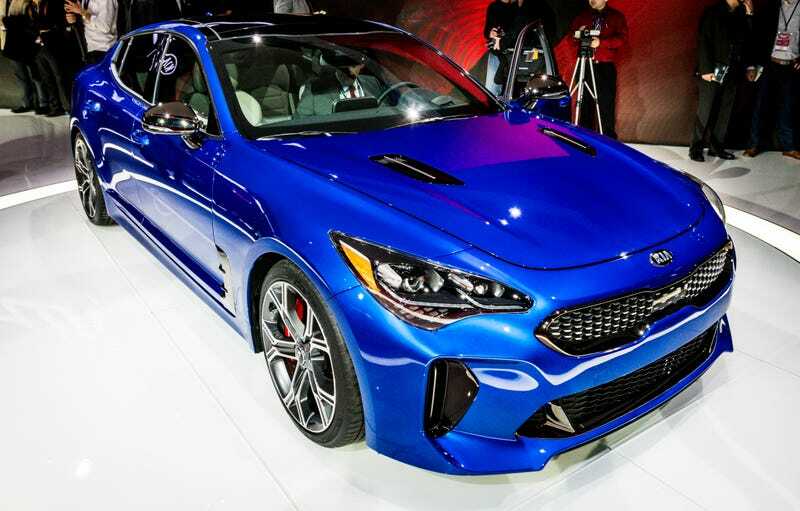 What The Hell Happened To The Kia GT4 Stinger Concept? I hope so, actually. This is a cool car, and again, the kind of stuff people who love cars ask automakers to build. It’s not a massive crossover, it’s not autonomous, it’s not electric or hybridized—it just seems like a solid, good-looking performance car from a brand that hasn’t done that before. I hope it works out. I’m just not confident it will. Buy this thing if you like it. Send the car companies the right message. And if nothing else, it will be a hell of a used car bargain.